Msgr. Frederick Easton had been a priest for less than a year in the spring of 1967 when he was asked to consider serving in the Metropolitan Tribunal, the archdiocese’s canon law court. The tribunal primarily works with Catholics in central and southern Indiana seeking a declaration of nullity of a previous civil marriage, commonly called an annulment. In his ministry in the tribunal, Msgr. Easton also dealt with a wide range of other cases, from clerical sexual abuse to the beatification and canonization causes of St. Theodora Guérin and the Servant of God Simon Bruté, the first bishop of the Diocese of Vincennes, which later became the Archdiocese of Indianapolis. Since May of 1967, Msgr. Easton has continually either studied canon law or served in the tribunal, including leading it as archdiocesan vicar judicial from 1980 until his retirement in 2011. And after retiring, he continues to minister as adjunct vicar judicial and assists in canon law matters both in the archdiocese and beyond. 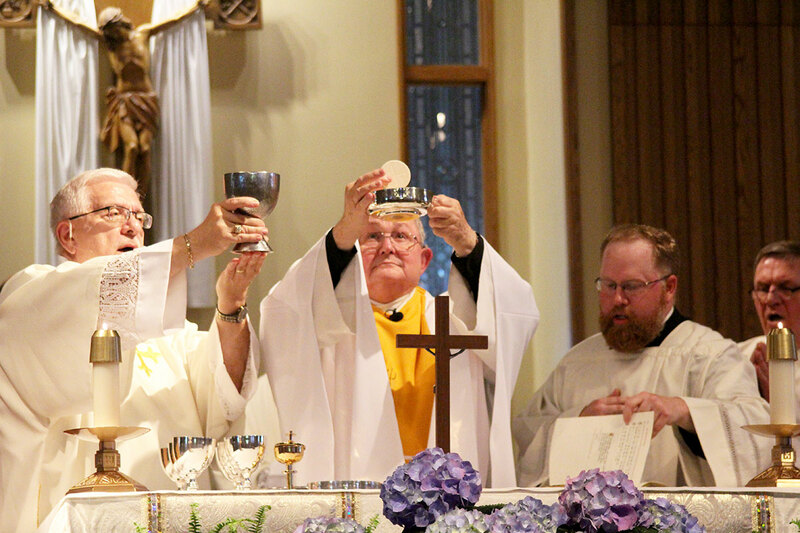 “In retrospect, after having been in the work for a while, it seemed that I did have a vocation within a vocation, a vocation to canon law, as it were,” said Msgr. Easton, who lives in retirement in Bloomington. It was at St. Charles Borromeo Church in Bloomington where Msgr. Easton was the principal celebrant of a May 1 Mass to celebrate the 50th anniversary of his priestly ordination. Those who filled the church included Archbishop Joseph W. Tobin, Bishop Charles C. Thompson of Evansville, Ind., Bishop Gerald A. Gettelfinger, retired bishop of Evansville, and 27 concelebrating priests. Msgr. Easton has inspired many people over the years in his ministry in the tribunal, including Father Joseph Newton, the archdiocese’s current vicar judicial, who was born 10 years after Msgr. Easton was ordained. Msgr. Easton also guided the ministry in the tribunal of Father Robert Gilday, pastor of St. Therese of the Infant Jesus (Little Flower) Parish in Indianapolis and archdiocesan vice vicar judicial. In addition to serving in parishes, Father Gilday has ministered in the tribunal continually since 1980. Msgr. Easton’s dedication to canon law and his broad knowledge of it led to a national and international reputation in the field. He played a lead role in the development of the Canon Law Society of America’s guidebook for the implementation of the U.S. bishops’ 2002 “Charter for the Protection of Children and Young People,” and received the society’s top honor, the Rule of Law Award, the following year. Although respected around the world for his knowledge and application of canon law, Msgr. Easton doesn’t take well to the praise that is heaped on him. He instead turns the focus on God. One of the reasons that Msgr. Easton and the archdiocese’s tribunal has such a strong reputation in the broader Church is that, unlike most dioceses, it has had staff members who have remained there for decades. Through all his years in the tribunal and in his continuing ministry in canon law, Msgr. Easton has always sought to keep a close connection between this ministry, which he describes as cerebral and intellectual, to the pastoral ministry of the Church to ordinary Catholics. “We were really helping the parish priest and the people who work with him to do his ministry,” he said. “Law is about the enshrining of the values of the institution. Well, the values of the institution and the promoting of those is what pastoral ministry is all about, too. During his decades of service in the tribunal, Msgr. Easton continued to provide weekend sacramental assistance in archdiocesan parishes, serving from 1995-2011 at Holy Trinity Parish in Edinburgh and St. Rose of Lima Parish in Franklin. Pat Rose met him at St. Rose, where he is a parishioner and has come to value his friendship with Msgr. Easton over the past two decades. Rose was at Msgr. Easton’s jubilee Mass at St. Charles on May 1. Father Newton was also present, serving as master of ceremonies for the liturgy. Like Rose, Father Newton has a close friendship with Msgr. Easton and keeps him “on speed dial” to consult with him on canonical matters. 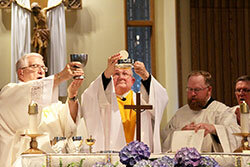 In looking back over his 50 years of priestly life and ministry, Msgr. Easton had words of advice for men considering a possible vocation to the priesthood today. “We are to know the history of our Church,” he said. “We are to bring forward the values of the Church, to know them from the inside out and then to share that wealth of information with the people. That’s what priests do.